December 13, 2013 | 12:45 p.m. The late Virgil Olson included the History Center in his estate. 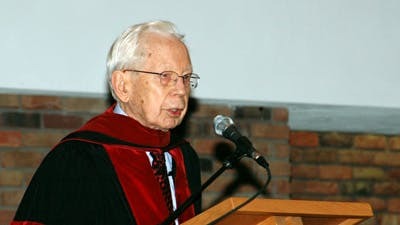 The History Center recently received a $20,000 endowment from the estate of the late Virgil Olson, who served Bethel University in several roles during a long career at both the seminary and the college. Located on the second floor of the Carl H. Lundquist Addition at the Bethel Seminary Library in St. Paul, the History Center houses and archives documents significant to Swedish Baptist institutional, cultural, and immigration history; Converge Worldwide; and Bethel University. 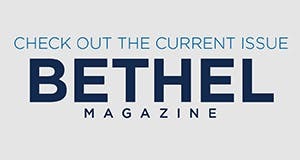 It is funded in part by Bethel University, Converge Worldwide, and through the fundraising efforts of the Friends of the History Center, which is comprised of volunteers who promote the work of the History Center, present fundraising/educational events, develop a newsletter, and advocate for The History Center’s staff, funding, space, and projects. Expressing gratitude for all that Olson gave to Bethel, she remarks, "It's so moving that someone who invested their whole living life in Bethel will continue to significantly invest in Bethel after their passing." The History Center has also published several books about Converge Worldwide/Bethel history, including New Center Directions, 5 Decades of Growth and Change, and the just-released Give First Priority to Jesus Christ, about the life of former Bethel President Carl Lundquist. To be included in the History Center’s mailing list, please contact Carole Spickelmier at jcspickelmier@msn.com. Visit Bethel’s Campus Store to order the History Center’s books. Find out more about including Bethel University in your estate plans, or contact Dan Wiersum at 651.635.8052.